The best meatloaf? Really? Well, I think it is. I've been making meatloaf for years and years and years, and while I've made it differently at different times, this is my current favorite version. It's rich, tangy and moist with a caramelized tomato-based sauce (aka ketchup) on top. And the little pockets of creamy feta cheese add another layer of richness. Most times, I like to pair it with creamy mashed potatoes but occasionally I'll make creamy mashed cauliflower instead, like today. You might be surprised at how especially delicious cauliflower can be when made this way. Annie's Naturals was sweeter than Heinz or Hunt's and that didn't appeal to me. In large bowl whisk together egg, worcestershire sauce, soy sauce, crushed red pepper, mustard, salt, pepper, bell pepper, garlic, parsley and ketchup. Next add ground sirloin and ground pork and mix together using your hands. Just mix until blended but don't over mix. Lastly, add the crumbled feta and gently mix in. Place mixture in loaf baking dish or pan, then make the sauce. Mix all ingredients together and spread on top. Place in oven and bake for 45-55 minutes. Meatloaf should be hot, bubbly and starting to brown. Place under broiler for 5 minutes to caramelize ketchup mixture. Let rest for a few minutes before slicing and serving. Trim stem and leaves from cauliflower head and cut florets from core. Cut florets into small pieces and steam for 15 - 20 minutes until very soft. Remove from steam and allow cauliflower to dry out a little or blot with paper towels. Place cauliflower in medium bowl and mash well with a potato masher or a fork. Add cream cheese, yogurt, butter, salt and pepper to mashed cauliflower and mix well. 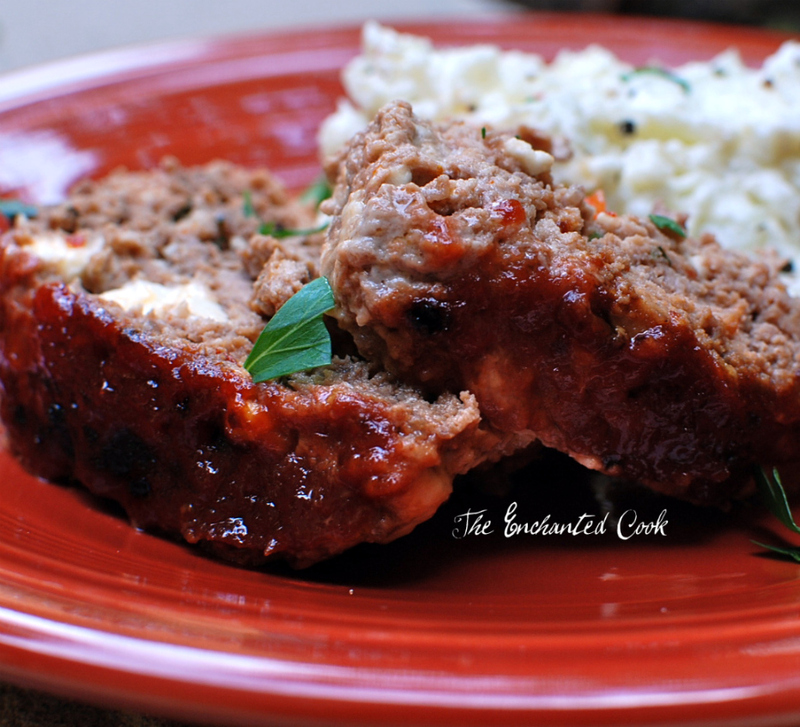 Leftover meatloaf makes excellent sandwiches the next day! i love meatloaf! unfortunately living with a vegetarian prevents me from whipping this up - maybe i'll try your recipe with lentils?! Excellent photos!!! 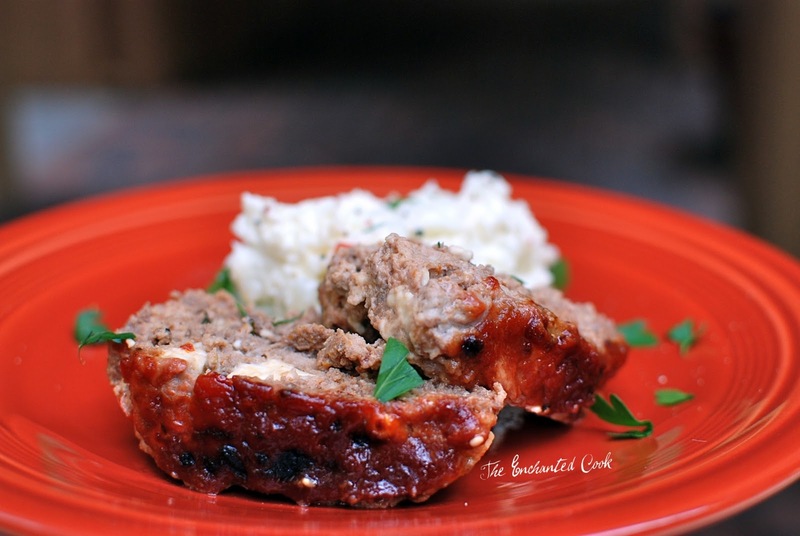 I've tried to photograph meatloaf and got the proverbial "nothin'" Love the recipe for both! OMG Kim I am laughing so hard right now! If you knew how many times I've tried in the past and how many photos I took this go round...why is it so hard to get a good pic of something that tastes so good?!! I love the addition of feta to this classic recipe. And I gotta try the cauliflower mash. Just bought a huge cauliflower last night and now I know what to do with it. Lovely photos! Meatloaf is one of my favorite dishes and yours looks so good. Never had cauliflower mash, but I like eating raw. Anonymous - I cannot thank you enough for leaving me such an amazing comment. It means the world. I'm so thrilled you've tried my recipes and even more thrilled that you liked them! Many thanks for taking the time to come back and let me know.